Do the Americans have any legitimate chance to win the second biggest race at the Breeders' Cup--the $3 million Breeders' Cup Turf? Right now, I would have to say no. With Gio Ponti being pointed toward the Classic, it seems that most Americans are pinning their hopes on Presious Passion. Yes, he has runaway speed and hypothetically could run the closing Euros off their feet, but I ask you, is this the only legitimate threat we have to knock of a powerful trio of Euros that includes defending champ Conduit, his equally-talented stablemate Spanish Moon, and super filly Dar Re Mi, who seems to be leaning towards the Turf? As the final days approach, I'm sure there will be one or two other Euros entering the Turf as well. Other than Presious Passion, our top contenders from what I can tell are Just as Well, who won the Northern Dancer by DQ; grisly veteran Grand Couturier; Joe Hirsch Turf Classic upsetter Interpatation; and Telling, third behind Interpatation. Does this strike fear into anyone? Not me. The Euros are looking very, very strong for the Turf. 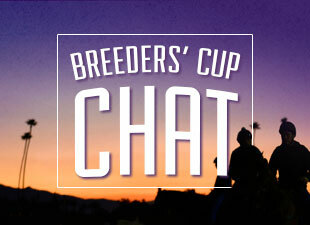 Anyone interested in a Breeders' Cup contest? Here's how it will work: On Oct. 28 (next Wednesday), pre-entries will be drawn for the two-day Breeders' Cup World Championships. Based on those pre-entries, we will have the probable fields for each race. You will have between Oct. 28 and Nov. 2 to make your selections. Of course there are going to be a few scratches and defections as the week goes on, but if we waited until the final entries and post positions were drawn on Nov. 2 and 3, there wouldn't be enough time to calculate the picks. (I do have other work to do you know). 1) Pick the winner and second place finisher in each of the 14 BC races. 2) The final tally will be based on a $2 win/$2 place bet in each race. At the end of the 14 races we will add up all the payouts and the winner will be the person with the most money in their bankroll. 3) In the event of an unlikely tie, the tiebreaker goes to the person who has the most money in the BC Classic. *Note: The scoring is not complicated, but to be clear if you pick, let's say, Einstein to win the BC Classic and he finishes second, you get no money for that pick. He would have to win. Or, if you pick Forever Together to finish second in the F&M Turf and she wins, you will only get her second place money. Understand? The rules are very simple. The pari-mutuel system rewards players who pick longshots instead of just all favorites. Let me know if there are any questions. I will remind everyone of the contest on Oct. 28 when pre-entries are released. The winner, aside from having bragging rights, will get to write a guest blog about any topic that they wish. Of course, it is subject to editing. I'll also see what I can come up with as far as other prizes, although at this time I cannot promise anything specific.